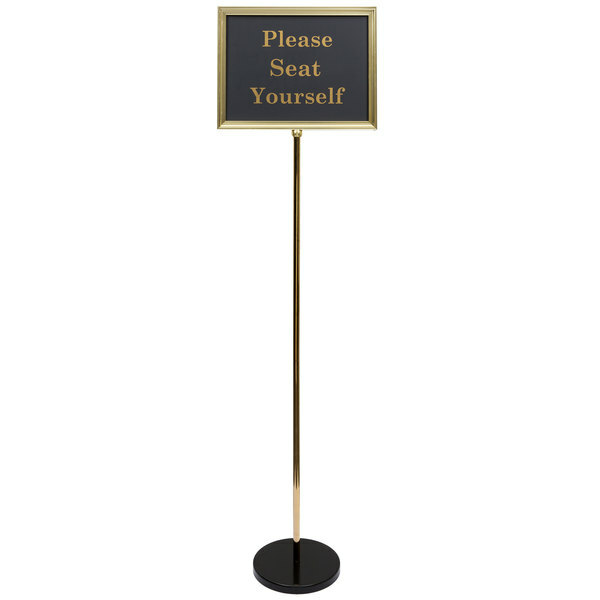 Help your guests get where they need to go with this Lancaster Table & Seating brass aluminum 60" changeable hostess / teller sign with 15 messages! Featuring a timeless brass-colored, lightweight aluminum construction and versatile 60" height, this sign ensures a practical, yet professional, addition to virtually any establishment. Use it in your restaurant, bar, cafe, or deli. It's great for catered events, too! It comes complete with 15 changeable messages on 8 signs (7 double-sided, 1 single-sided) that store within the frame for easy access, anytime. This sign's messages are silk-screened in sophisticated gold print for an upscale appearance against the black sign board. The signs themselves measure 15" in length for optimum visibility without detracting from your decor. At the same time, the entire unit stands 60" tall, meeting most guests at eye-level. Sign Face Length: 13 15/16"
Sign Face Width: 10 5/8"